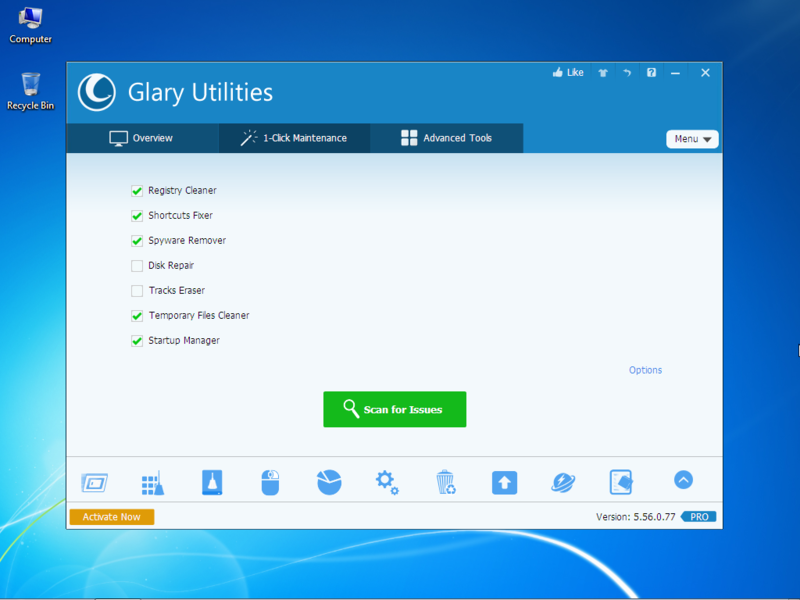 Glary Utilities Pro Free Download 2016 Edition latest version 5.56 for Windows 32/64 bit. Get Glary Utilities Pro offline setup, standalone installer. Glary Utilities Pro is a compilation of many tools which scans your sistem for multiple issues and tries to fix them as automatic or with user input. The user interface is basicaly the same with the free version of Glary Utilities. The difference is made by having a better scanning and cleaning engine, support and other features. The 1-Click Maintenance is a fast way to configure and start a full system scanning. You get to pick which types of checks to be performed on your computer. Also by going to Options before starting the scan you can specify if you only want a scan or a scan and repair issues that may be found on your computer. Many other tools can be found by going to the Advanced Tools menu. You have to possibility to protect your files with highly secure encryption. Multiple files formats can be encrypted, text files, word documents, PDF files, pictures and executable files. If you want to recover deleted files use the File Undelete tool. This component scans different parts of your drive and retrieve a list with many of your deleted files. Use the File Filter to improve the accuracy of the search and to have a better chance of recovering the right files. You will also find tools which are designed to improve the security and the privacy of your system. The Tracks Eraser has the duty of deleting useless data that you gather by browsing the Internet. Many browsers store useless data on your computer. Cookies, cached files, searched terms are ways on which your activity is tracked on the Internet. It’s recommended to close your browser before starting the scanning process. After you get the results, you can pick which data you want to keep and which one you want to be erased. More accurate scanning and cleaning process. Disk Defragmenter: quick and easy disk defragmenter and optimizer. Registry Fixer and Cleaner: scans the full system registry and displays a list with broken and useless registry keys. Manage services and applications which are loaded at the system startup. Browser assistant to enable, disable or delete add-ons who might cause performance and stability issues to your Web Browser. License: Trial for 30 days. Click the link below to start the Glary Utilities Pro Free Download Latest Version 5.56. If you have any problems while downloading please leave a comment below. After the page opens remember to choose the “Download through your browser” option to start downloading Glary Utilities Pro Offline Installer, Standalone Setup.